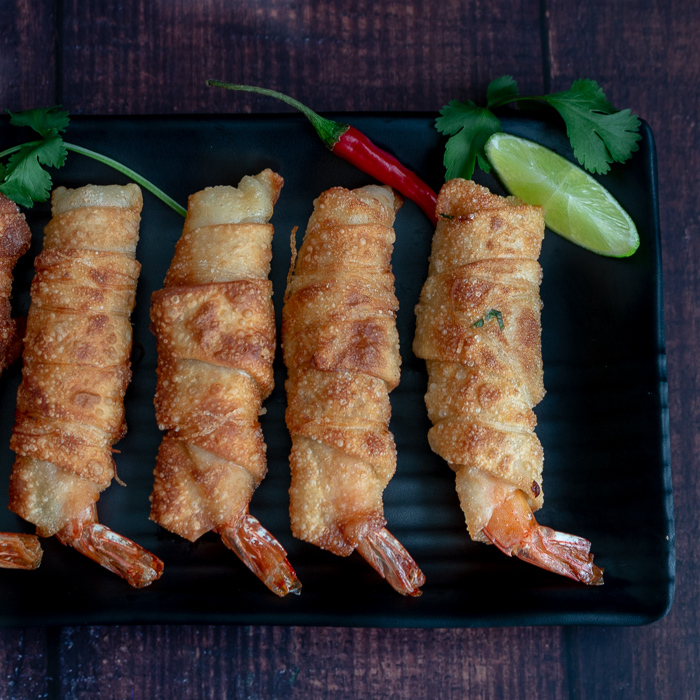 Thai Firecracker Shrimp Party Appetizer is a deliciously marinated shrimp with the tail on, bundled in a spring roll wrapper and pan fried until golden. Served with a Prik Nam Pla dipping sauce. STEP BY STEP PHOTOS and VIDEO Included. One bite and you will be hooked. 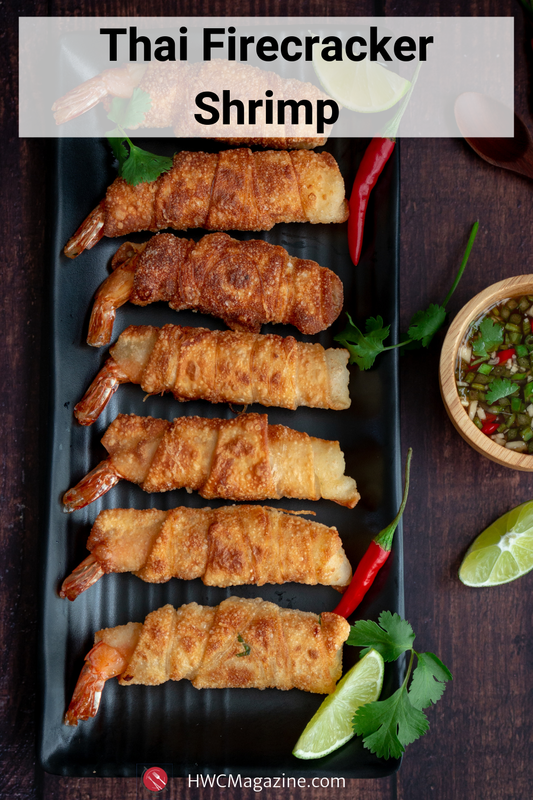 Thai Firecracker Shrimp Party Appetizer has this outer crispy exterior wrapped around a succulent juicy shrimp that makes them so addicting. 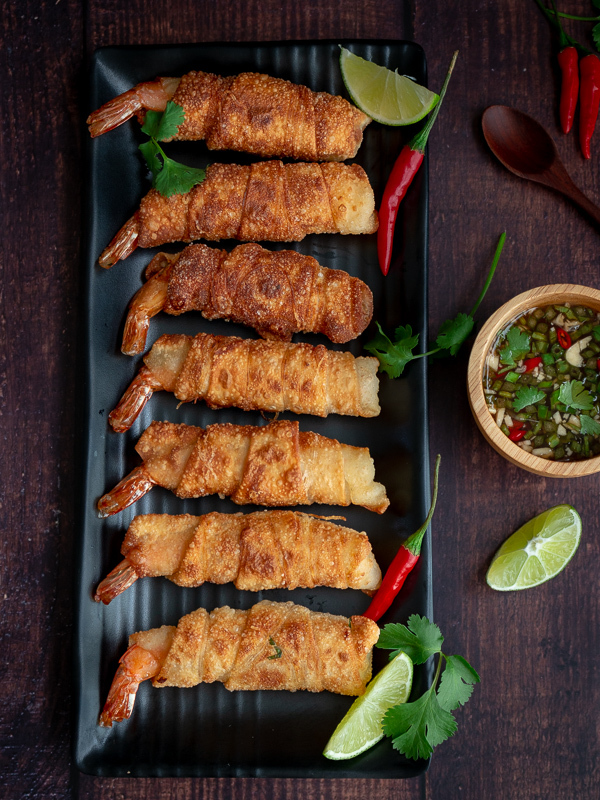 Your guests will love dipping this finger food appetizer by the shrimp tail into a little Prik Nam Pla Sauce. If you missed the recipe for our Prik Nam Pla – the incredible Thai Table Condiment, be sure to check it out as you are going to want to slater this sauce on everything. We love this appetizer because it is always a hit with guests and family too. Make extra as they go fast. You are going to love this appetizer because you can prepare everything BEFORE your guests arrive. Then a quick 2-3 minutes in the frying pan and you are done. 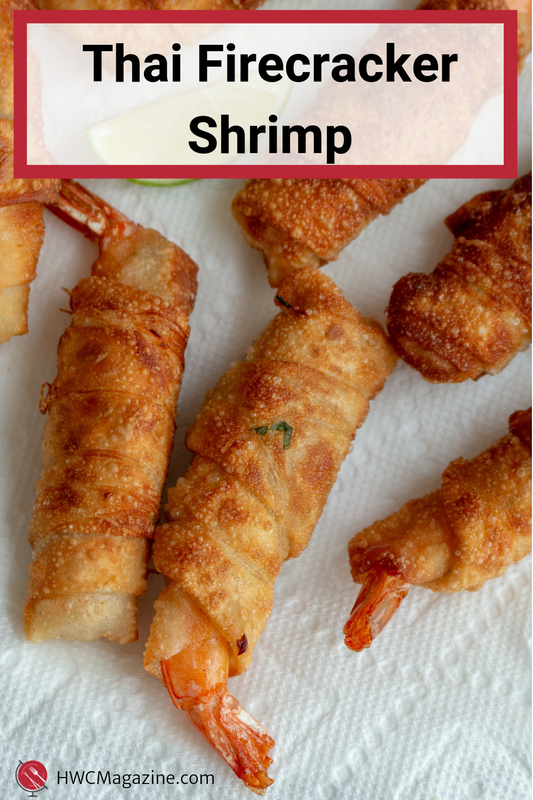 If you have an air fryer, these Thai Firecracker Shrimp Party Appetizer would be delicious cooked in there as well. What if I need to stay Gluten-Free or on a KETO or LOW CARB/ Diabetic Friendly diet? Great news! We found Thrive Market Organic Original Coconut Wraps that are both gluten-free and KETO friendly. 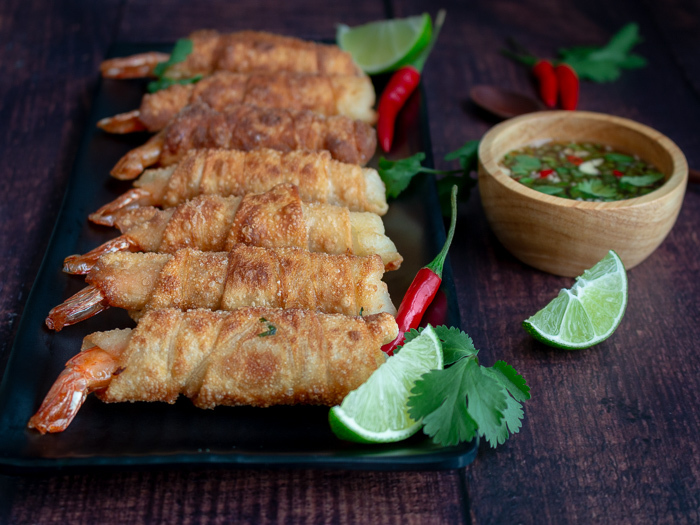 The best wrappers to use are spring rolls as they are super thin and crisp up well when fried. However, you can also use egg roll wrappers in a pinch. Egg Roll wrappers are a little thicker but still delicious. We actually used egg roll wrappers for part of this photo shoot as that is what we had on hand. You see we had to make a million of these Thai Firecracker Shrimp Party Appetizer to keep the natives happy while we shot a couple of photos. (Smiling…) In addition, Thai Kitchen and Red Boat has a gluten free version of fish sauce. Fish sauce is generally speaking gluten-free but if you are celiac you need to make sure that it is produced in a gluten-free environment. Are you a Thai Food lover? We sure are! The addictive blend of spicy, savory, sour and slightly sweet with the fresh ingredients make it something we could eat almost every day. Be sure to check out our Thai Cuisine category for inspiration. We are going to be enjoying a few Thai recipes over the next 30 days so stay tuned. Are Shrimp and Prawn the same thing? Actually, no but either of them can be used in this recipe. Shrimp have plate-like gills and a set of claws on their front two pairs of legs. However, Prawns have branching gills, and claws on three sets of their legs, with the front pair being noticeably larger. We think that shrimps have a little saltier taste vs prawns which are naturally a little sweeter. Many times, prawns will be larger than shrimp and a bit more expensive as well. 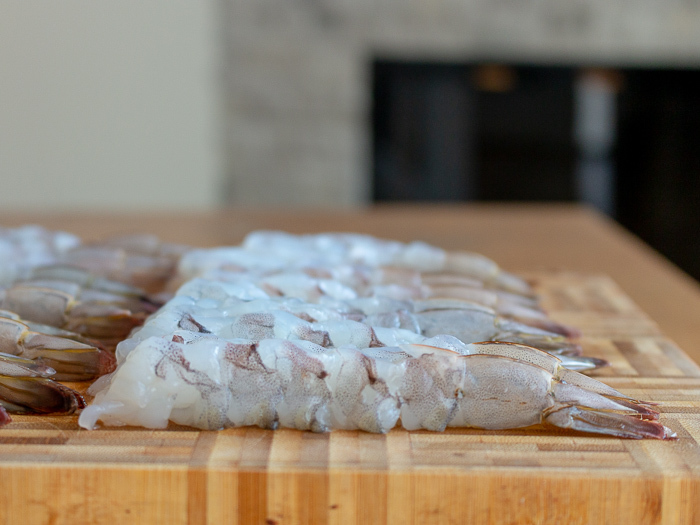 Have we ever told you about the time the husband brought home a 3 whole live fish from the wet market prawns that had not been cleaned, gutted or scaled by the Hong Kong fish monger and then heads back out the door? Stand in my shoes for a moment… First time in Hong Kong, never cleaned a fish before and your handed over 3 little fish and a mess of prawns in a bag still swimming. What would you do? Well of course, I filled up the kitchen sink with water and put the fish in to swim around. The significant other walks back in the door and says," where is my fish dinner?" I promptly respond, we have to buy a fish tank for the fish. I cannot kill a fish, they look at you with those puppy eyes. Okay, so here is the scoop. If you plan to use LIVE shrimp or prawns in this recipe, throw them in ice. The ice stuns them and makes them go to sleep so they are easier to clean and prep for this recipe. The same goes for fish. LIVE Fish- No problem. Peel and Devein your raw shrimp but leave the tail on. 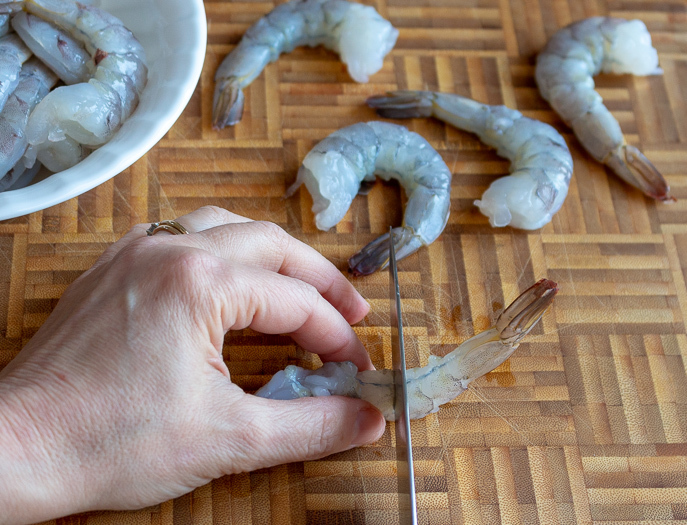 After that, you need to make the shrimp Flat and long by cutting along the curved edge of the shrimp about ½ way through the shrimp about 1cm apart down the shrimp. Next, turn the shrimp with the top side up and press the shrimp down between your fingers to flatten. You will hear the little crackle in the shrimp when you do this. Marinate your shrimp with aromatics and lime juice. Place your spring roll on a flat working surface. Brush a little egg wash around the edges of the spring roll. 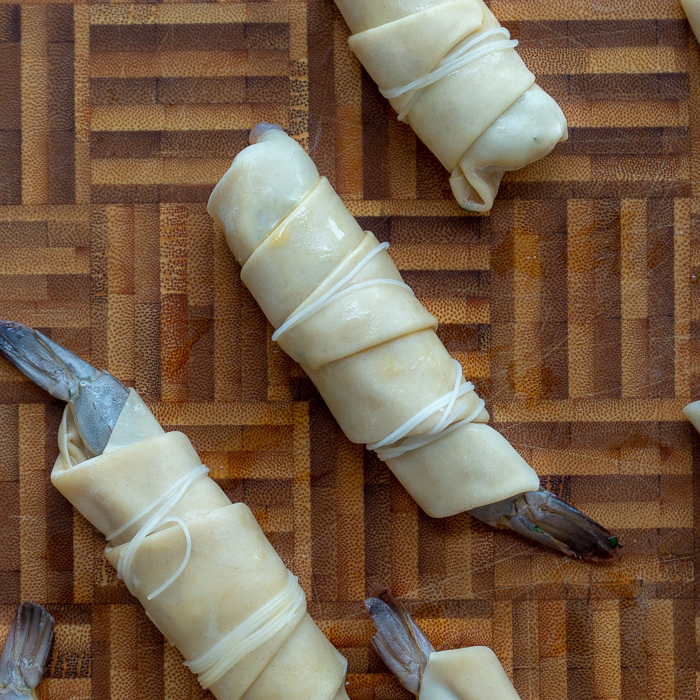 Place the shrimp on the end of the spring roll on an angle. Be sure to keep the tail of the shrimp exposed. 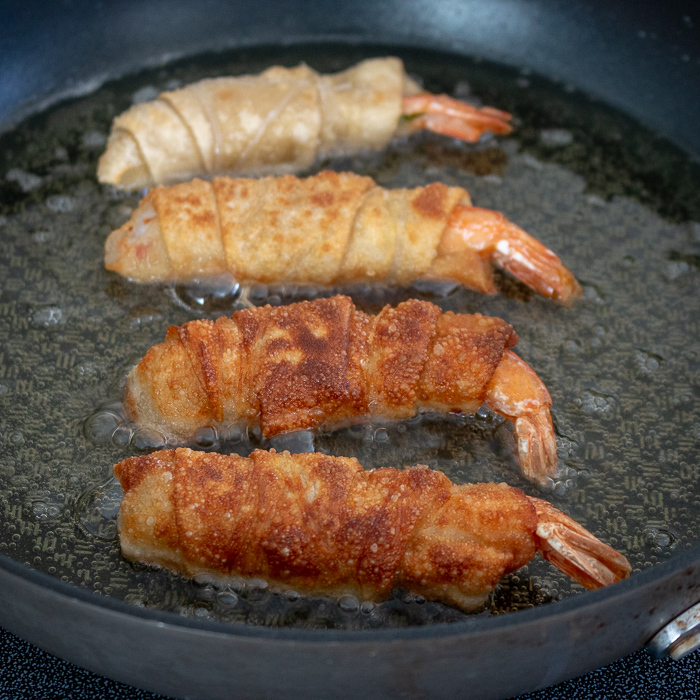 Fold over the spring roll over the shrimp once, making sure that you keep the tail of the shrimp out. 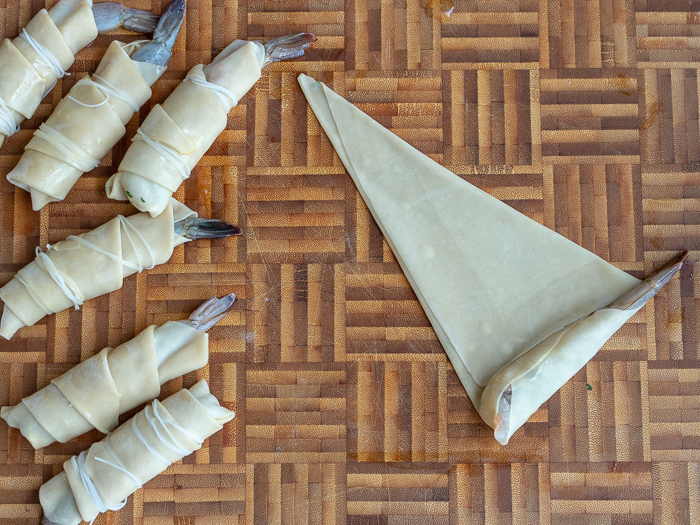 Next, fold the spring roll lengthwise (vertically) as if you are making a diamond. 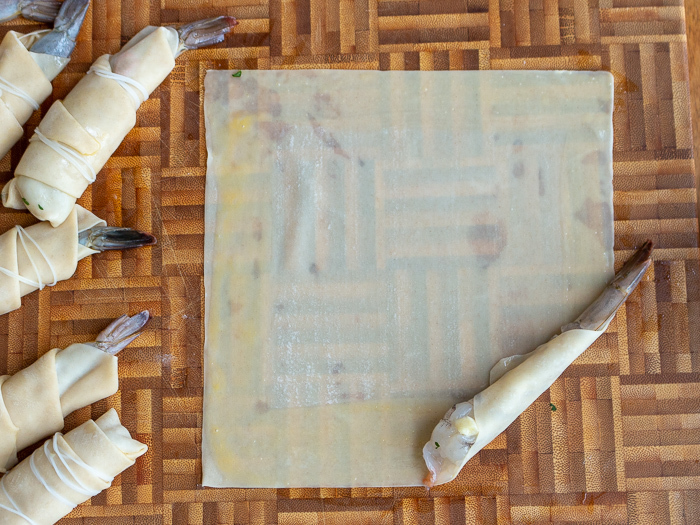 Then, fold the spring roll lengthwise (vertically) on the other side, making sure to keep the tail out. Next, brush on a little more egg wash over the spring roll. Roll the shrimp up in the spring roll diamond. It will look like a crescent roll when you are done. Fry your Thai Firecracker Shrimp Party Appetizer for 2-3 minutes on each side until golden brown. Enjoy with delicious Prik Nam Pla condiment sauce. If you make our recipe be sure to tag us on INSTAGRAM with @hwcmagazine. We love seeing what you are making in your kitchen. 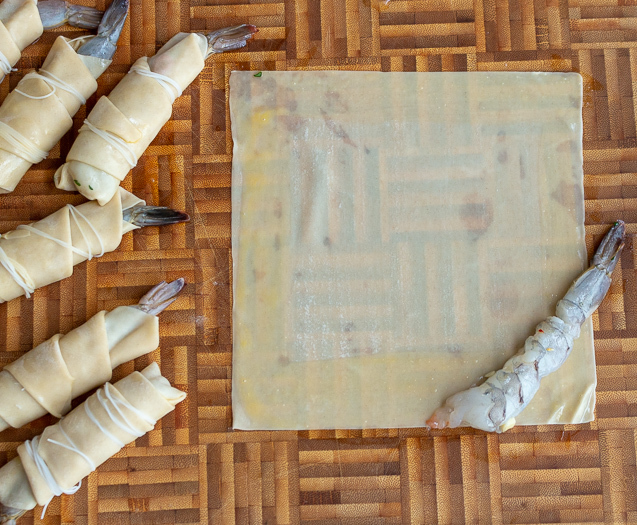 Be sure to check out the step by step photos in the Post above or watch our video to learn how to wrap up your shrimp bundles. 1 Remove the shells and devein your shrimp but remember to LEAVE the TAIL ON. 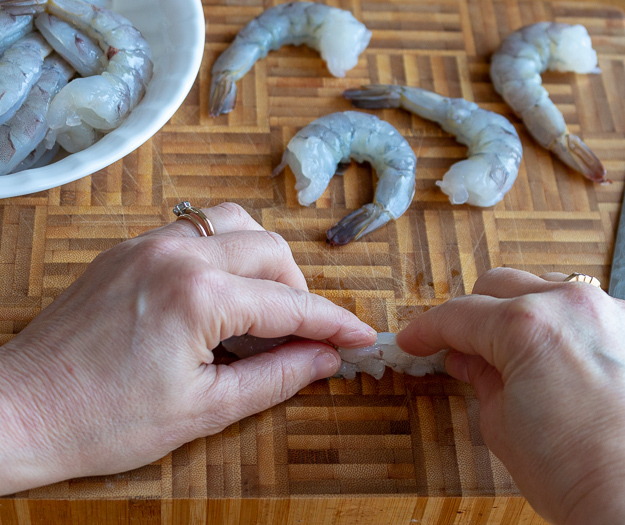 Next, you need to make the shrimp Flat and long by cutting along the curved bottom edge of the shrimp about ½ way through the shrimp about 1cm apart down the shrimp. 2Turn the shrimp with the top side up and press the shrimp down between your fingers to flatten. You will hear the little crackle in the shrimp when you do this. Don’t worry this is normal. 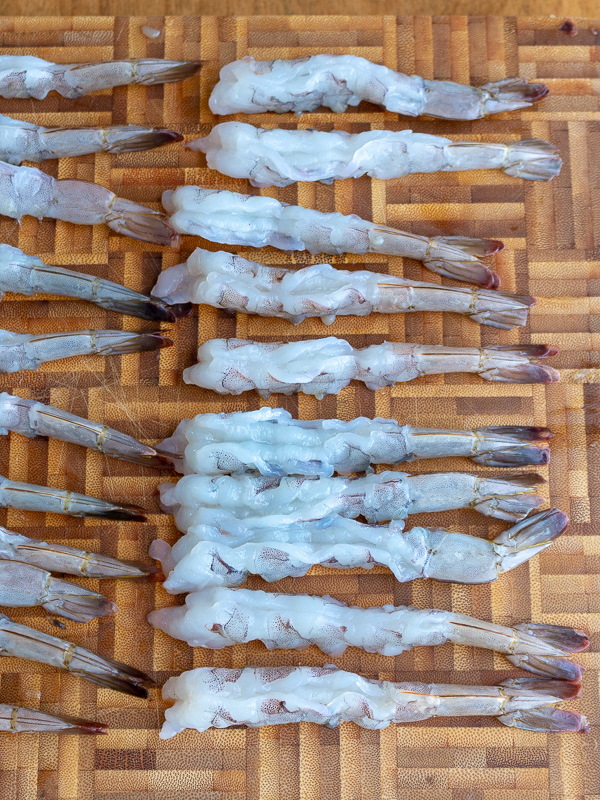 Flatten your shrimp. 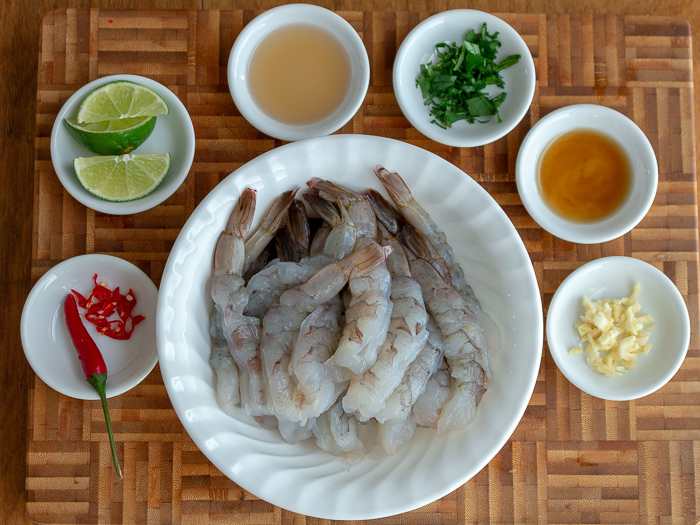 3Marinate your prepared shrimp with garlic, chili, sesame oil, cilantro, lime juice and fish sauce. Toss and set aside. 4Open up your spring roll wrappers. Please place a slightly damp cloth on the ones that you are not using so they do not dry out. Place one spring roll on a flat working surface. 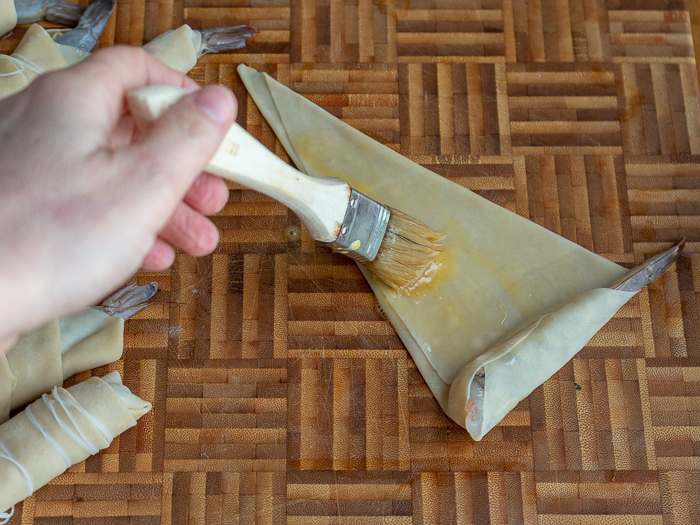 Brush a little egg wash around the edges of the spring roll. 5Place one shrimp on the end of the spring roll on an angle. Be sure to keep the tail of the shrimp exposed. 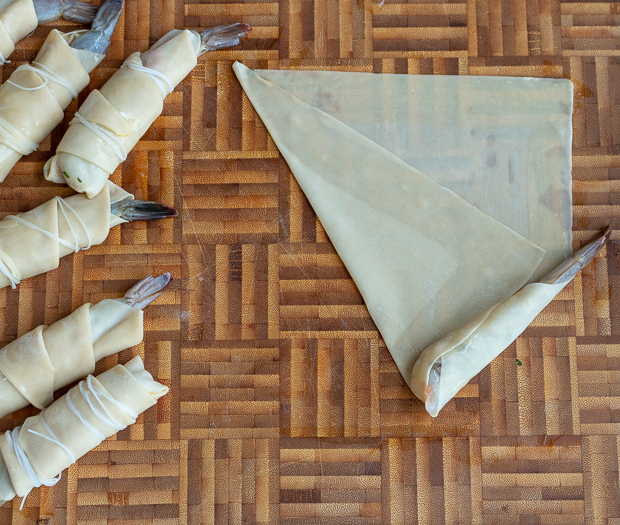 Fold over the spring roll over the shrimp once, making sure that you keep the tail of the shrimp out. 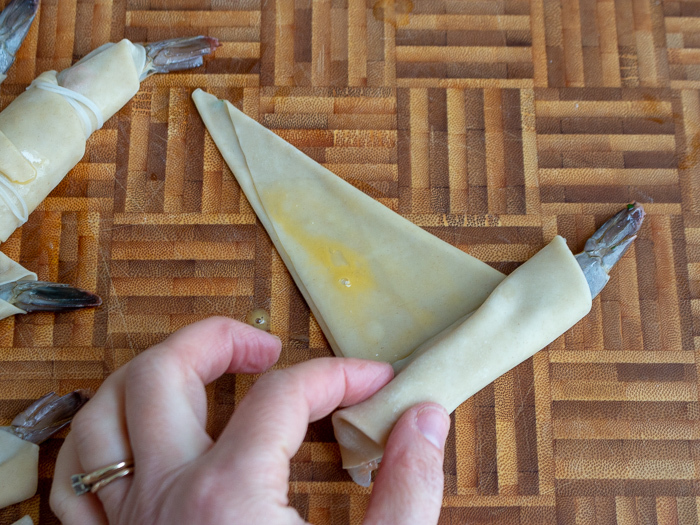 Next, fold the spring roll lengthwise (vertically) as if you are making a diamond. Then, fold the spring roll lengthwise (vertically) on the other side, making sure to keep the tail out. Next, brush on a little more egg wash over the spring roll. Roll the shrimp up in the spring roll diamond. It will look like a crescent roll when you are done. 8Fry your Thai Firecracker Shrimp Party Appetizer for 2-3 minutes on each side until golden brown. If you have a deep fryer that works nice as well but we just shallowed fry on both sides to conserve on oil. 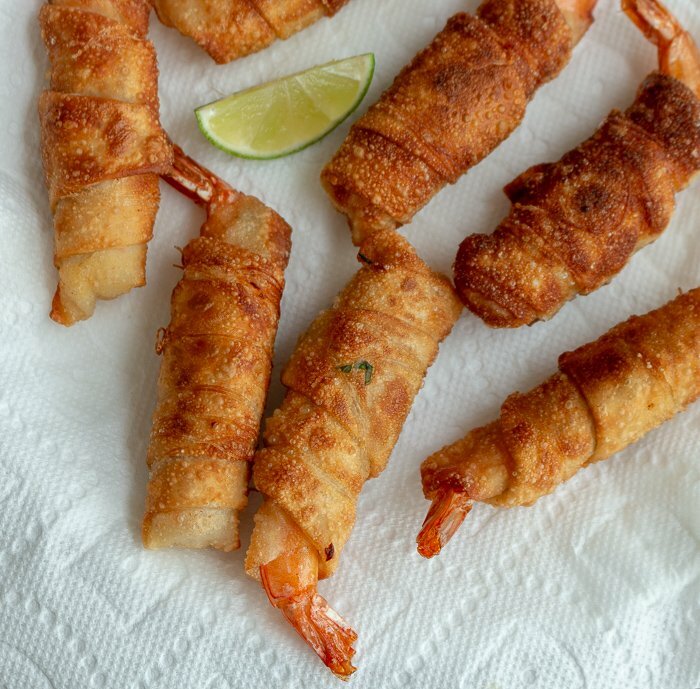 If you have an air fryer, these delicious shrimp bundles would be fabulous in the air fryer. 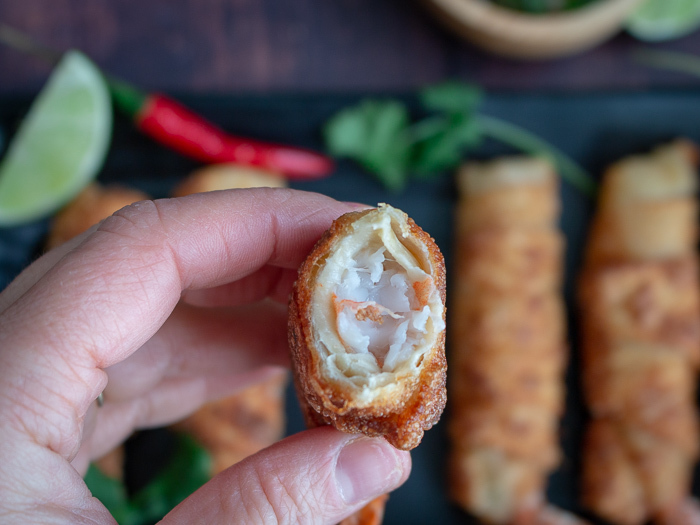 Your goal is for the spring roll to be golden brown and the shrimp to be tender and no longer opaque but cooked through and still has that delightful crunch. 10Dip and Enjoy your Thai Firecracker Shrimp Party Appetizer with delicious Prik Nam Pla condiment sauce.